You have some options when it comes to managing the media in your media bin. Clicking on the Edit button will open another window (see below). Clicking on the Delete button will delete the media from Kaltura My Media. After deleting it from here, you might still be able to find it in your CaptureSpace Library (unless you had previously chosen to delete uploaded files from your Library). Depending upon media type, the editing options will change. 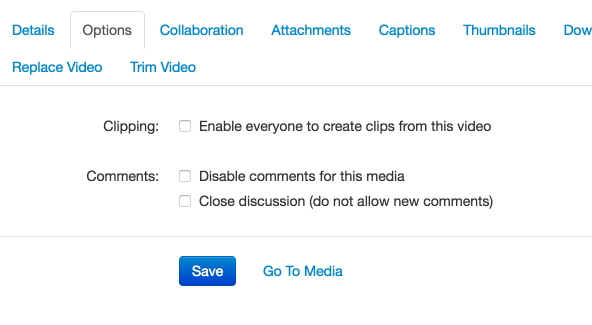 All the options for editing are found as blue links below the media preview (the image below shows the options for video). Details allows you to edit the name of the media as well as add a description and/or tags. You can allow everyone to be able to create clips from the original media. You can also manage whether you want to allow comments or not. You can create clips yourself by clicking on Go To Media found to the right of the blue Save button (see section below). Choosing Collaboration allows you to add one or more people to be co-editors (can make edits to the original media) or co-publishers (can only publish the media on their sites). 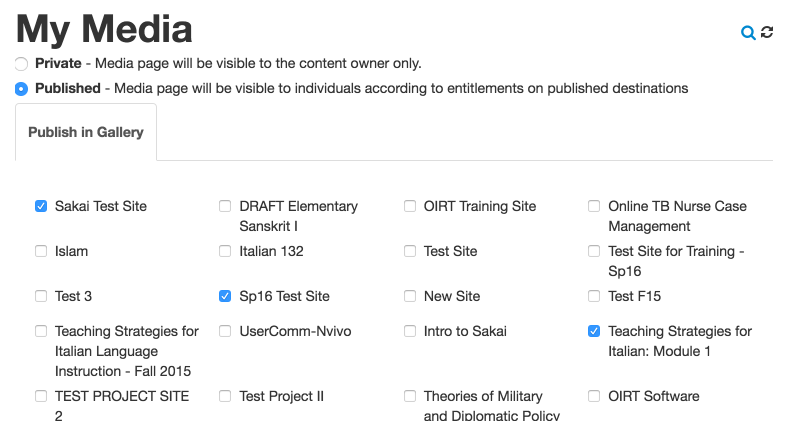 Add a Collaborator by clicking on the Add Collaborator button and enter their netID or email address (depending on how they are registered with Sakai). You can attach a transcript, additional documentation or anything else you would like to accompany the media. To attach a file simply click on the blue Upload File button. If you have created a captions file in any of the accepted file types you can upload it in this section. 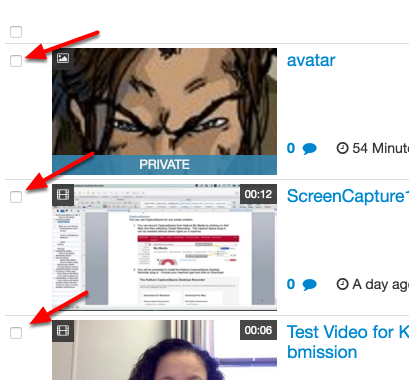 You can upload, capture or auto-generate a thumbnail for your media. You can enable downloads of the file in different sizes. This can also be helpful if you lose the original file and need to download a copy for yourself. You can insert images (png, jpg) into a recording. You can also create chapters within the video for easy navigation. You can easily replace the previously uploaded video without breaking any links to this media that might already exist on your sites. 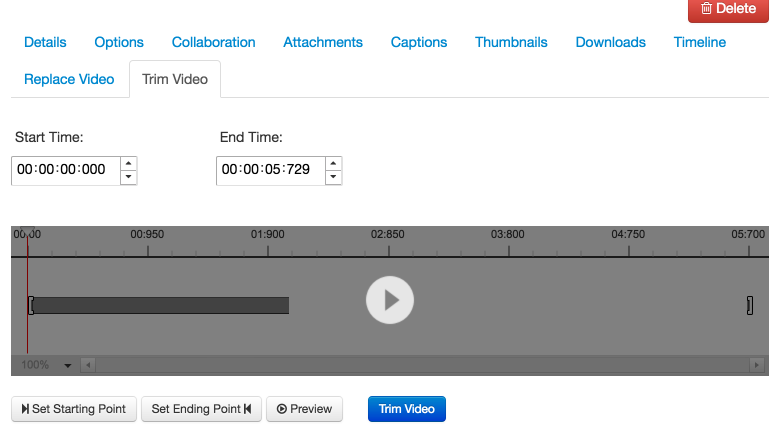 You can edit the beginning and end points on video or audio files. Clicking on this option will allow you to make additional changes to your media. Details: shows you the description, tags, which sites the media is published to as well as any comments that have been made. Share: produces an embed code that you can use to place the video in another website if you want. Actions: Allows you to publish the media to a site, see the viewing analytics, create a clip from the original media, edit (sends you to the previous screen), and delete. 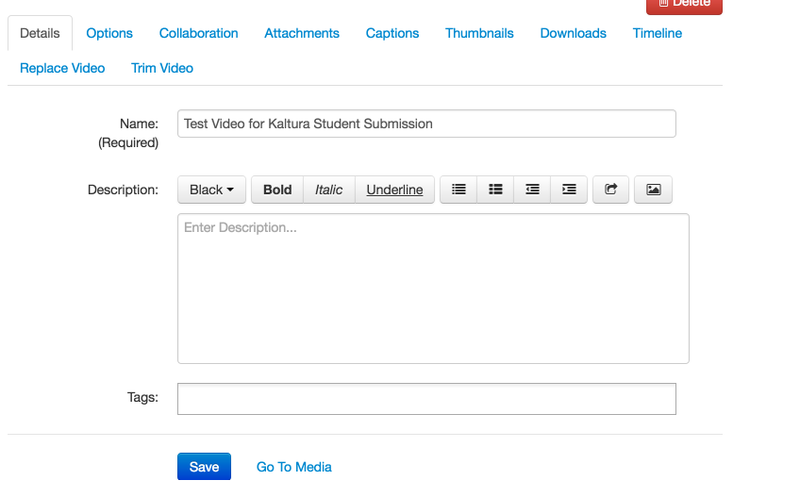 You can use the sharing capability within Kaltura My Media to add media to multiple sites at the same time. However, if you only want to share with one site we suggest you do that from the Kaltura Media Gallery within the specific course site. Check the boxes found to the left of the media thumbnails to select them. Select Publish from the dropdown menu. You can choose to make the video Private or Publish it, but if you leave it Private it will not be viewable in a site. Normally you want to do this in Kaltura Media Gallery. However if you change the status from published to private for a particular piece of media that has already been published in multiple sites, you can effectively unpublish it from All Media Galleries in one step. Check the boxes next to the name of the sites where you would like to publish the media files. Scroll to the bottom of the page and click Save. You will see a message displayed at the top of the screen that will tell you that the media has successfully been published. 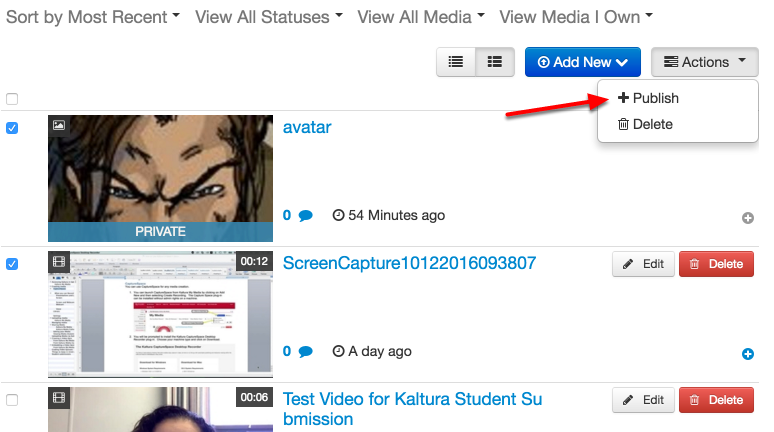 Your media can now be found in the Media Gallery of each site that you shared it to.